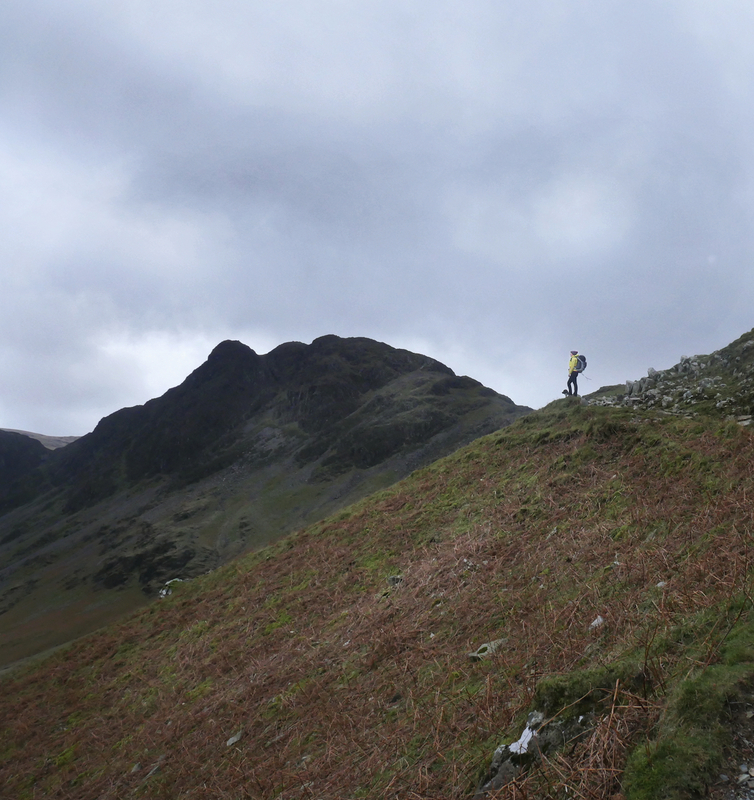 Hay Stacks – a favourite walk amongst walkers in the Lake District. 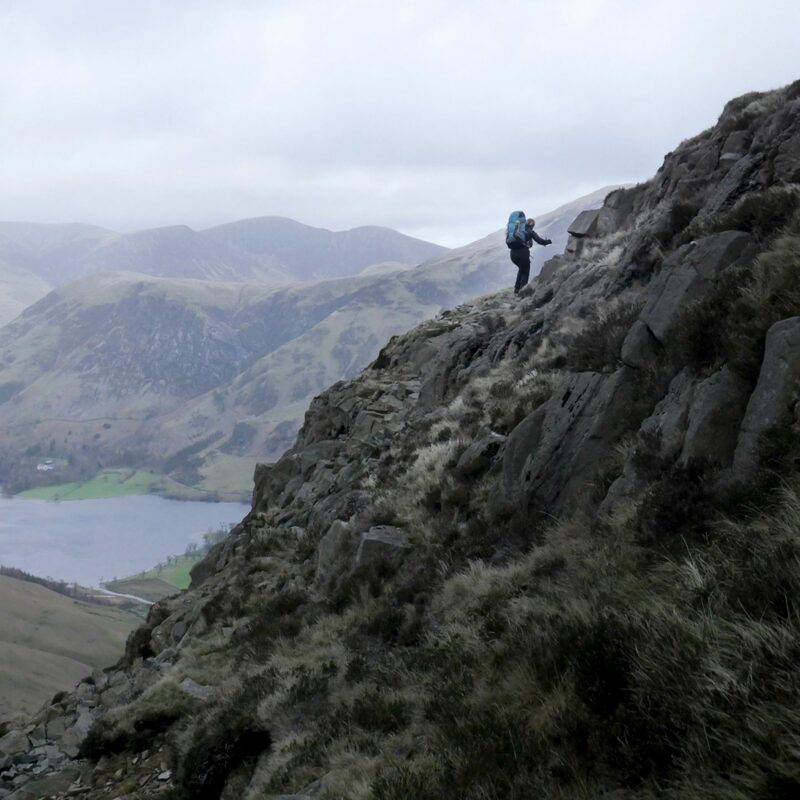 This little mountain has always had people it in its thrall but for some reason I’ve never felt the urge to go and climb it for myself, despite it being renowned as Alfred Wainwright’s favourite peak. Haystacks stands unabashed and unashamed in the midst of a circle of such loftier fells, like a shaggy terrier in the company of foxhounds … but not one of this distinguished group of mountains around Ennerdale and Buttermere can show a greater variety and a more fascinating arrangement of interesting features. My decision to climb it actually had nothing to do with its reputation – much to my abash when actually going and reading Wainwright’s writings on the peak, as you can see above, but for the fact I wanted to do a wild camp with my dog… The solution to a winter walk and camping with a likely very wet and muddy dog, I decided, was to overnight in a bothy rather than a tent and set my sights on Warnscale Head bothy above Buttermere lake. Packing our bags, the car and bundling the dog in we set out for the Lake District. Planning to take in High Crag, as well as Hay Stacks on the way to the bothy we set out early on a November Friday morning. All the free spaces were taken so scraping together £4 for the car park at Gatesgarth Cottage we set out. The weather wasn’t exactly on our side – that much had been apparent from the start of the day and didn’t improve as we came over the A66. It soon became apparent that we wouldn’t have enough time in the day to take in the longer route we’d planned as the day was going to be short – even for a typical winter one. As neither me nor Martha had been to this particular bothy before we erred on the side of caution; we’d read it could be a little difficult to locate as it blended into its cliff backdrop of grey rock. 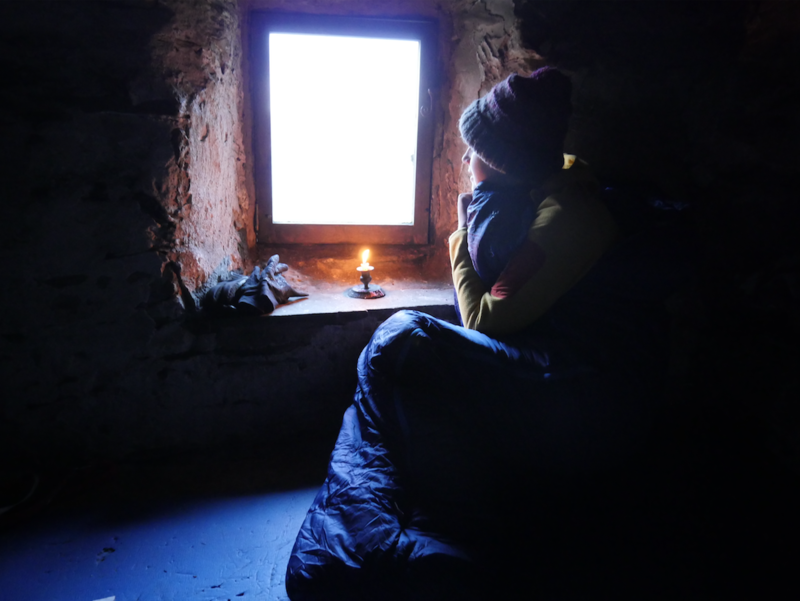 The last thing we wanted to do was to be searching for a well-concealed bothy in darkness. 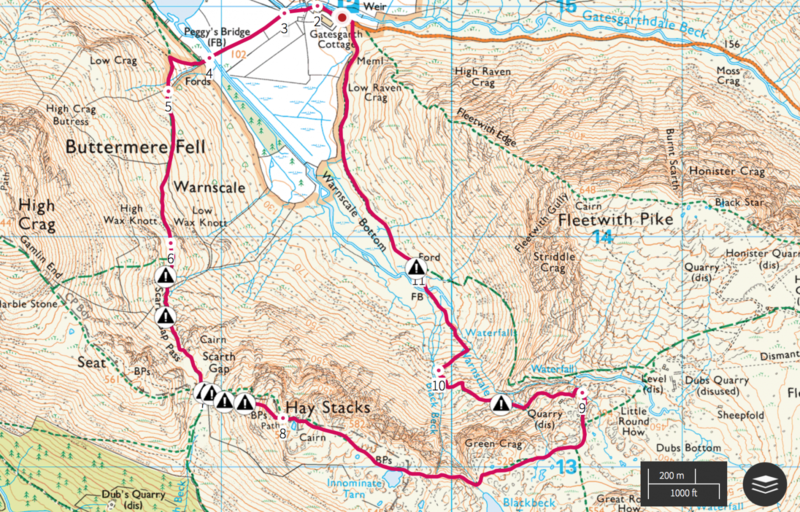 Using Ordnance Survey Maps here to show the route. 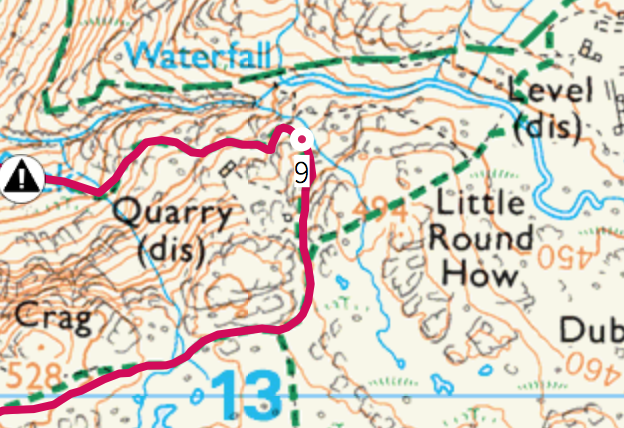 You can see the tiny bothy marked on the map above the ‘y’ of Quarry. Decision made to take the shorter route, we set out for Buttermere Fell, making our way for Scarth Gap Pass with Buttermere lake falling away behind us. 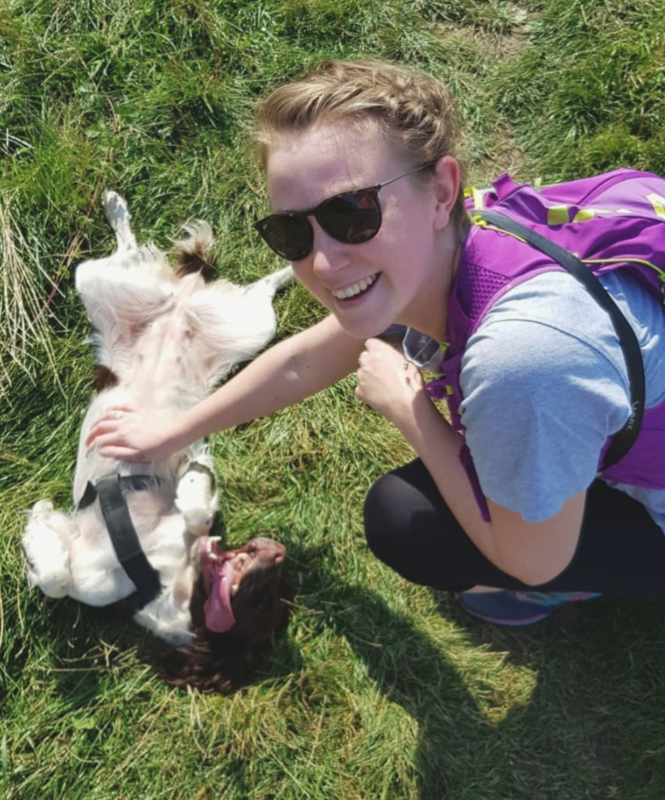 The path was man made and well trodden, so easy walking – for this, I was very grateful as I was carrying the extra weight of food, extra water and towel for the dog, which I was not used to. On a lovely sunny day I could imagine this would be an incredibly popular path – it would be one to be up at the crack of dawn for. Imagining what the dawn light would be like is certainly making me want to return another time as this was certainly living up to its Wainwright’s claims so far. As we approached Scarth Gap we heard the roaring sound of something fast rushing headlong towards us. Sure enough, as we rose out of the pass the wind hit us full on; suddenly making the easy terrain we’d been covering that much harder. 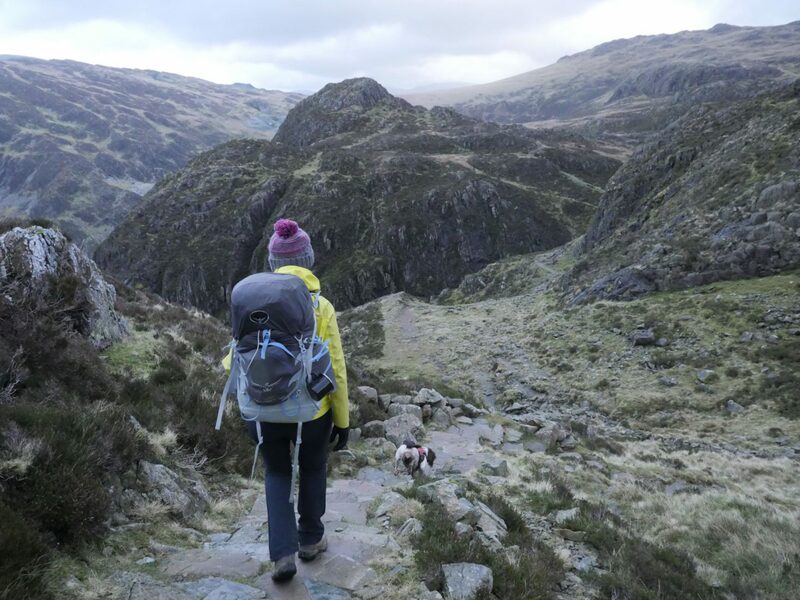 Smacking into our bulging rucksacks and throwing us off balance, it made me just slightly concerned for the craggy sections to come. Quite what I was expecting the peak to look like or be like to walk over I don’t know but the steep north facing cliffs were not it. I am obviously not good at visualising a mountain’s shape from the map… Now I was here and seeing it for the first time I felt completely at home, despite that it looked so ominous with roiling grey skies behind. This was one of the first times I’d taken Flo to the mountains. 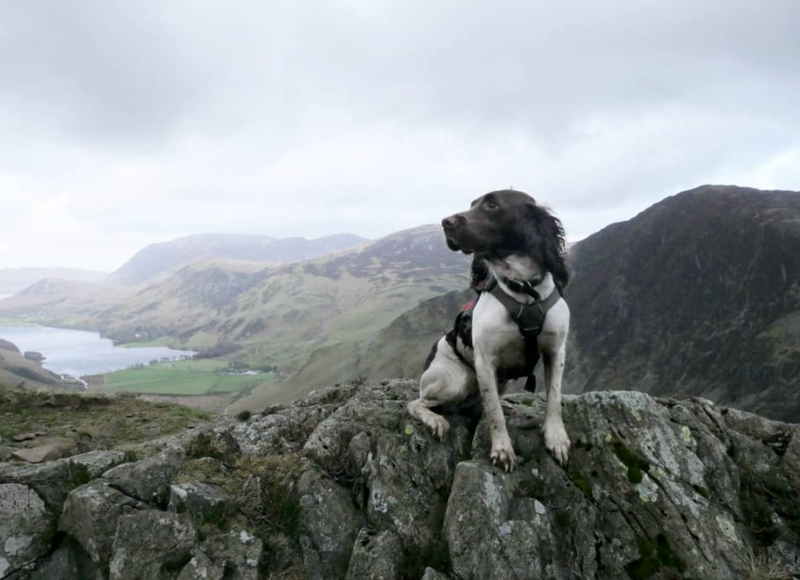 She’d been up Goatfell on the Isle of Arran before and had been good as gold – in fact, she’d been the perfect mountain dog – so although I had little concern about her being able to cope on the terrain itself, I was slightly nervous about her not being able to hear me in the high wind. Not giving her the usual free reign she enjoys when we head out, I kept her close as we scrambled up. 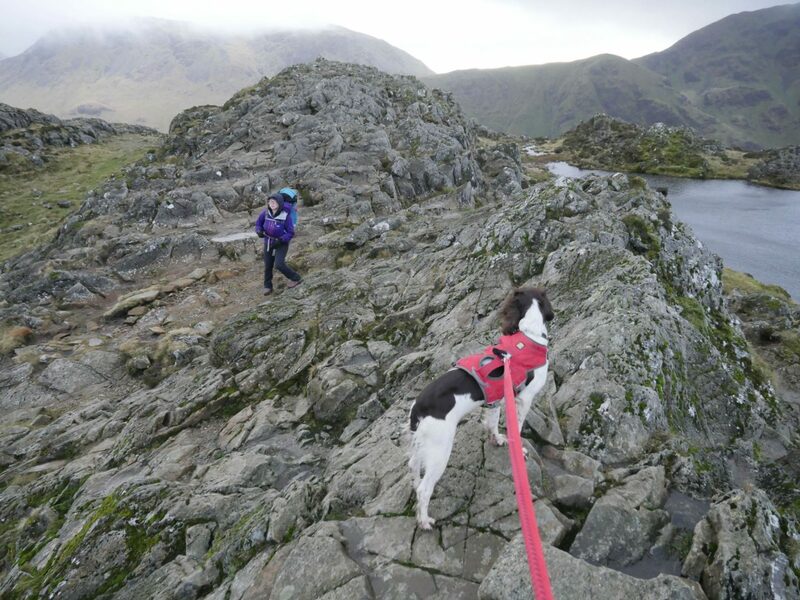 While I was getting thoroughly battered by the never ending onslaught from the wind, she was completely unfazed by it and as soon as we were up and away from the cliffs she was let loose again. Seeing her exploring and that tail wagging non-stop fills me with so much happiness. We arrived at Warnscale head bothy at around 3pm, set ourselves up on the two benches that run along two of the walls and went about having a little bit of an explore. The bothy itself is well hidden. Built into the side of a scree slope it’s easy to miss and we were very glad we made the decision to get there in the light. 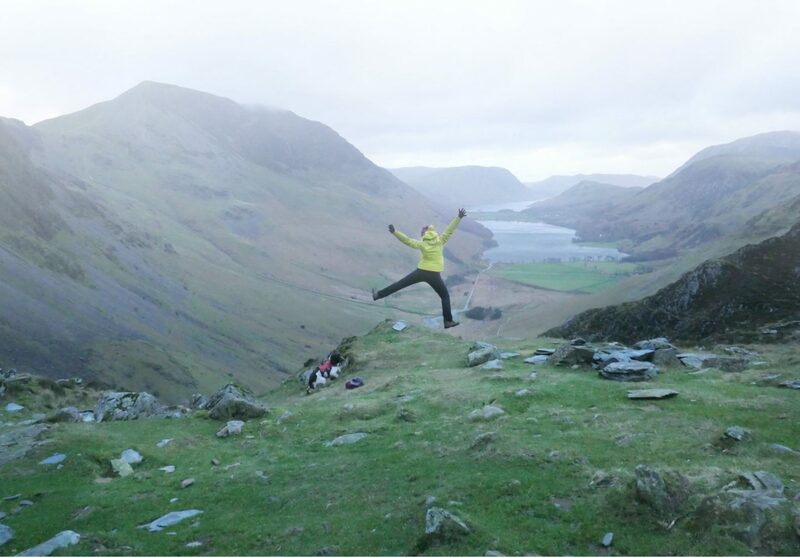 Sitting right at the head of the valley overlooking Buttermere Lake, you’d be hard pressed to find a better view. A little window in the bothy’s main room overlooked the lake, providing a little bit of light into the stone hut. It was at this point that we realised we’d made a big mistake. In the name of packing light we’d brought minimal stuff to do – and no fire log to help keep us warm. So with one book between us there was only one option – read aloud. So for the next several hours Martha continued to skip through the pages about Edmund Hilary’s journey to climbing Everest. Around 7pm we heard the tell tale sounds of somebody approaching the bothy and were suddenly glad for being there at such an early hour. Rather than share the sheltered hut, they opted for a wild – wild camp. Assuming they were pretty seasoned mountain people we were sure they must have a good idea of what the weather was doing so it seemed like madness that they’d rather sleep outdoors but it was nice having the hut back to ourselves. 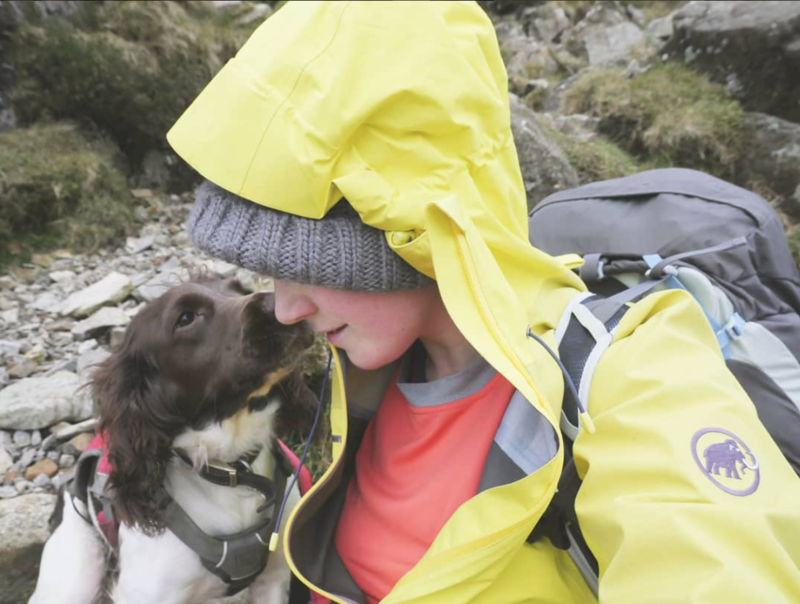 Drifting in and out of sleep for a lot of the evening, I was dire company but the prolonged snoozing was obviously much needed on my part – and I felt so at peace in the fresh mountain air, curled up in my sleeping bag with the dog by my side. I woke the next morning feeling utterly rested – better than a sleep in my bed at home that’s for sure! Side note, if you’ve not yet got your hands on the Pictorial Guides to the Lakeland Fells by Wainwright – you simply must. The sketches and descriptions are pure gold.